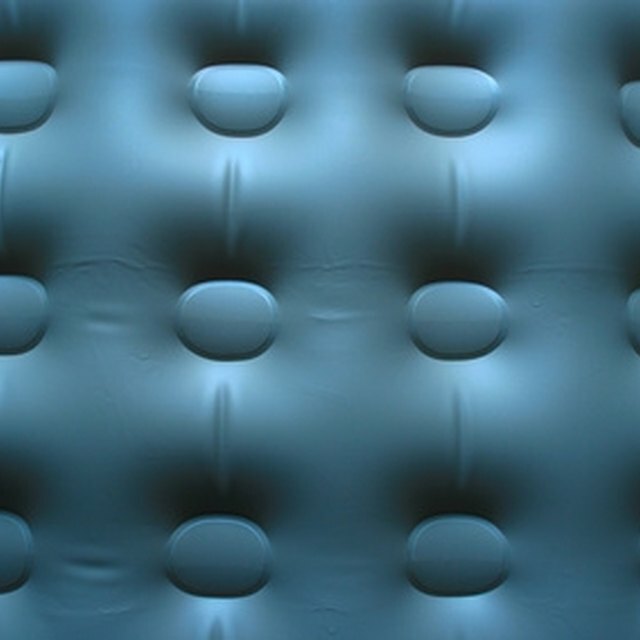 An inflatable bed with a puncture can often be repaired and used normally if the hole is not larger than an inch in diameter. Jagged rips or tears in the material probably make your blow-up bed a suitable candidate for the landfill. However, small punctures such as pin pricks can be patched with readily available repair kits. The kits are available at sporting goods and hardware stores. Look for kits with a tube of liquid cement, rubber patches and a scraping tool to roughen the surface of the bed. Pump up the inflatable bed to locate the hole if it is not already obvious. Mix soap and water in the squirt bottle and shake until foamy. Spray the foam onto the blow-up bed to look for bubbling that indicates a leaking hole in the bed. Circle the hole with the felt-tip pen. Let the air out of the bed to remove internal pressure that will make it more difficult to repair the material. Drag the scraper that comes with your kit over the spot to be repaired. Scraping the material can improve the cement's ability to hold the patch to the bed. Apply liquid cement from the tube in the kit and smear it over the hole in the bed. Remove the plastic backing on one of the patches in the repair kit and press the tacky side onto the cement. Press the patch onto the bed and hold in place for at least five minutes. Let the cement cure to the patch overnight before attempting to pump up the bed.